Two-way appraisal: Is that the way to a better workplace? Would you like to give a candid assessment of your boss? Some human resource experts say Singapore employers should consider a system known as "360-degree reviews" which include "upward appraisals". It means that just as bosses give their verdicts on subordinates, so underlings get to give their views on their bosses. But others argue that this sort of system would be hard to implement, given the top-down culture prevalent in Asia. Few workplace issues generate as much heated interest as the annual appraisal - as several recent letters to the Forum pages of The Straits Times demonstrate. "Many large organisations here carry out annual performance appraisals of their employees by ranking them according to a bell curve and classifying them into categories," said former NTUC Income chief executive Tan Kin Lian in a letter to The Straits Times Forum on Jan 2. "Those in the top categories get a reward for good performance, and those in the bottom categories are identified for reprimand or termination." He said that the implementation of this system has been rather poor, as ranking staff this way brings out unhealthy competition, leading to office politics. Author Raymond Anthony Fernando, 63, responded by suggesting the upward appraisal. 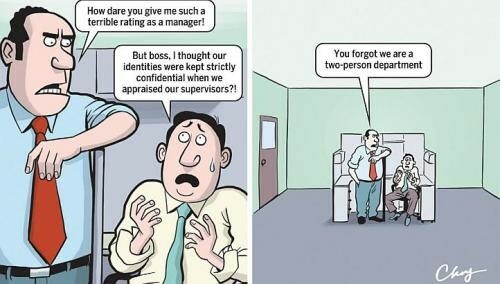 He wrote: "In organisations that use upward appraisals, the subordinates complete a questionnaire on how well their superiors manage them. "This usually takes place after the superiors have had the opportunity to finish preparing and discussing the subordinates' performance appraisals." He made the suggestion while working in the broadcasting industry, but never saw its implementation. He told The Straits Times: "I have a lot of friends going through difficulties in the office. They put in long hours but they're not appreciated. Sometimes it's not how hard you work, but how smart you work." Mr Fernando laments that he was promoted only twice in his 31-year-long career. "While I appreciate my company, I wish I could have ranked my supervisors. I've had both good and nasty bosses, bosses who I felt were not being fair to me." Another letter writer, Mr Steven Lee, 58, who was retrenched in 2012, has had bad experiences with appraisals. He wrote that while working at a multinational company (MNC), the appraisal process took place only on paper as his manager did not set objectives, recognise achievements or provide feedback regarding errors. "To make matters worse, his manager simply accepted his appraisal of my performance without questioning why I was suddenly rated poorly, even though I consistently performed well." Frustrated, he raised the issue with the HR department but could not find the answers he wanted, even though his appraisal was improved to the point of meeting expectations. Mr Josh Goh, assistant director of corporate services at The GMP Group, explains: "In 360-degree reviews, employees are assessed by their bosses, peers, colleagues and sometimes, external stakeholders. "With one-way appraisal, there is limited opportunity for the employees to voice their concerns and feedback on supervisors' management style." However, it might take a while for firms here to adopt the 360-degree review. Mr Jason Dacaret, managing director of RGF Executive Search, says that this is still a fairly new approach to performance evaluations, even by local standards. "The traditional top-down approach is not only common here, but in Asia where the values of respecting one's seniors are heavily instilled." For the system to work, Mr Dacaret says companies need to create a safe environment conducive to the practice and "alleviate any fear of being passed over for a potential promotion, or being treated unfairly in the future". Promoting professional yet friendly feedback, and reducing the stigma associated with upward appraisals would be a push in the right direction, he adds. Audit firm KPMG tries to create such an environment with various initiatives. These include the performance development system known as MyPD launched in 2012, and an online feedback system which allows employees to give feedback anonymously on any partner or manager they have worked with. Mr Quek Shu Ping, head of people, performance and culture at KPMG in Singapore, says: "MyPD promotes frequent, high-quality conversations on performance by facilitating ongoing, regular feedback between staff and their performance managers. "Appraisals do not thus have to be an annual affair, as this system facilitates a spirit of continuous dialogue." KPMG's 360-degree feedback system has also worked for employees, and they can give feedback throughout the year. "It has proven a useful tool to celebrate exemplary behaviour, by recording incidents where behaviour aligned with our core values can serve as case examples for the rest of us," says Mr Quek. For smaller firms such as Ascent Solutions, which specialises in an electronic tracking security system, a one-way appraisal system is more realistic. Chief executive Lim Chee Kean explains: "Being small, we now adopt a one-way system but we have included specific areas for every staff member to provide feedback and recommendation on whether the current management, work arrangement and environment could be further improved." As a former Asia-Pacific president at an MNC, he says there was not much truth that came from the 360-degree system. "Perhaps it was a cultural thing then, and the concern that managers might retaliate rashly to remarks from their staff." Mr Lee is sceptical about the 360-degree system, having been both a manager and a subordinate. He says: "I know how it works. Most of them dare not tell the truth, a lot of them will simply say you're doing fine. Who dares to tell the manager otherwise and how will you know if the manager will be fair to you? "On the surface, it sounds like a good idea, but there's always a risk you may get penalised."